Toorox was a Gentoo-based live DVD which boots into a KDE desktop using KNOPPIX hardware auto-detection and auto-configuration technologies. It was a useful tool for backing up data, browsing the Internet anonymously, or taking a first look at the capabilities of Linux. The live DVD can be installed to a hard disk with the help of a simple graphical installer. 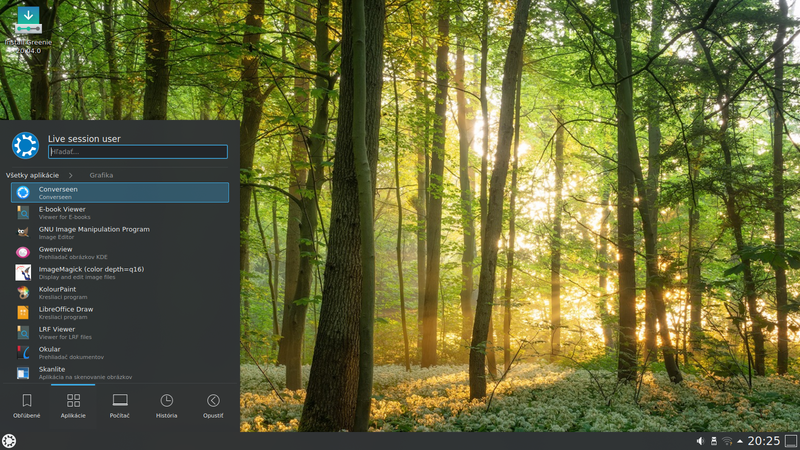 Rate this project Stanislav Hoferek has announced the release of Greenie Linux 9N, a beginner-friendly Ubuntu-based distribution with enhanced support for Slovak and Czech languages and extra software applications: "Greenie Linux 9N is finally here! Based on Ubuntu 11.04, Greenie uses the classic and solid GNOME 2.32.1 instead of GNOME 3 or Unity. Several new applications (FBReader, gToDo, Adobe Reader, Audacity), new versions of Firefox and all other software, and new, much darker artwork, are now in Greenie. Also we made it possible to run popular websites (Facebook, Twitter, Pastebin, YouTube, etc.) using the Run dialog. This version will come in both 32-bit and 64-bit flavours, and the 64-bit edition will be announced very soon." Read the release announcement (in Slovak, except for a brief English note at the bottom) for a detailed list of changes and new features. Download: greenie-9n-x86.iso (1,123MB, MD5). Stanislav Hoferek has announced the release of Greenie Linux 7.1L, an Ubuntu-based, user-friendly desktop distribution optimised for home users in Slovakia and Czech Republic (English is also supported): "Another Greenie Linux release is here. Greenie 7.1L is based on Ubuntu 10.04 LTS. What is new? Graphical design was replaced by our own theme called GreenieTree, new icons, new wallpapers. Newly added and re-added applications (Ufraw for editing RAW images, Fotoxx as an additional graphic editor and WINE for running Windows applications). Also, all upstream updates are included and a few bug fixes and additional translations are now also on the CD." Here is the brief release announcement. Download the live CD image from here: greenie-7.1l.iso (700MB, MD5).